When Jay gets a phone call telling him his older brother Chris is in jail he’s not surprised because he’s a junkie. He’s been in and out of trouble since their parents died in a car accident years ago. Reluctantly Jay heads to the police station, but from then on what was slow, small town life is never the same again. Chris’ business partner, Pete, has been found dead. Jay is confounded, because Chris can barely tell what time of day it is, never mind run a company. The local police think Chris is at fault, but there’s no evidence to say so and Jay gets his brother back on the streets. Again. Joe Clifford is acquisitions editor for Gutter Books and managing editor of The Flash Fiction Offensive. He is the author of three books. You can learn more about the author at www.joeclifford.com. The phrase ‘slow burn’ is often used to describe a story that steadily unfolds, usually maintaining the same unremitting pace until the final word. With Lamentation this too is apt. To a point. Because here Clifford has lit a fuse which leads to a rather large bomb which, when it explodes, leaves no-one unscathed and in the process ramps up the tension considerably in the back quarter. At the outset this seems like an ordinary enough tale. Small town boy who’s lost his family, has a troubled junkie brother, and is separated from Jenny, the woman he still loves and the mother of his son, because he doesn’t believe he’s good enough for her. Written in the first person through Jay’s eyes we understand fully the cul-de-sac he’s driven down. But with Pete’s murder this seemingly dead end life gets flipped upside down. Jay, reluctantly, begins to investigate Pete’s death because he’s doing something he’s spent his life on – looking after his waster older brother. The plot grows in complexity as Jay’s understanding widens until he and the reader is faced with the whole dirty picture. Clifford is a highly accomplished writer – the evidence is clear in his previous novels, Junkie Love and Wake The Undertaker. 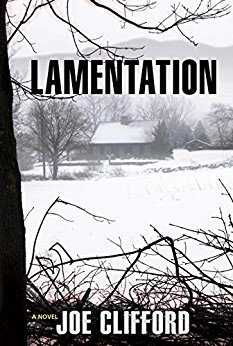 Lamentation is subtly different, but I find it hard to put my finger on why. Perhaps it’s because there is a large element of family involved. Secondly I like the fact that some of the questions the author poses, such as whether Jay’s parent’s death was an accident, aren’t fully answered at the conclusion. What had been a weight for Jay, he’s now able to cast off and properly live his life. And it’s these subtleties and extra layers that push the rating from four to five stars. If you don’t yet know Joe Clifford, you really should.